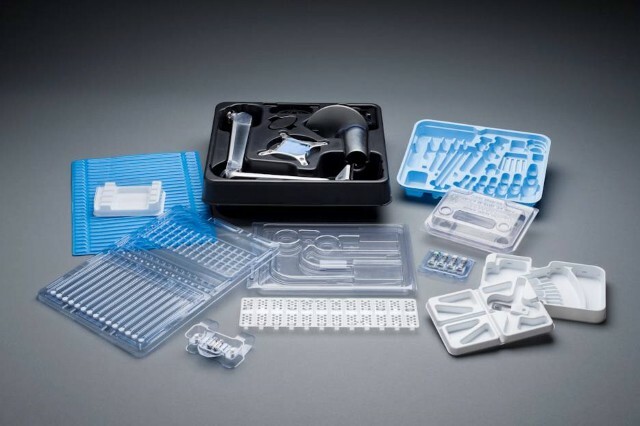 UFP Technologies has a long established history of utilizing rigid plastics as a material to design and create packaging solutions for a wide range of medical devices. This includes trays, blisters and other configurations that contain many different characteristics and properties that can meet numerous needs within the marketplace. PETG is a clear, tough, thermoplastic material that is easy to thermoform. It is ideal for medical applications because it stands up to radiation and chemical sterilization techniques without changing color. Polyethylene Terephthalate (PETE) is clear, rigid and has excellent gas and moisture barrier properties. It’s commonly used in soft drink bottles, injection molded consumer product containers, and both food and non-food containers. ABS (Acrylonitrile-Butadiene-Stryrene) is a thermoplastic known for lightness, rigidity and moldability. It comes in conductive and anti-static grades. UFP Technologies is able to provide a multitude of packaging solutions using rigid plastics that address specific industry requirements and adhere to strict, cost considerations. By using high impact polystyrene thermoformed material and utilizing our in-house engineering team, we were able to custom design a lower value, high volume surgical procedure kit into an in-expensive, quality solution.